When you first sat on that perfectly ordinary sofa, you may not have dreamed that it would change your life. It may have been your first time in someone's house or apartment. As you laughed and swapped stories, you realized that you felt different. This person was different. On that sofa, the two of you began to fall in love. Maybe it's a bit worn down. It no longer matches the other furniture in the room--pieces that you chose together. It never gave you enough back support, which you need more than ever. Your sense of style has changed. It's time to hold onto the relationship, but ditch that old sofa. But how? You have many options to get rid of old furniture. Some are easier than others. But there are exceptions. If you live near a college or university, putting an ad in the paper or on an online service such as Craigslist for your unwanted furniture might help you earn a little money. College students are a transient community, always in need of new and not-so-new furnishings. They can even move the sofa for you! Avoid the temptation of trying to sell the item for too much. Don't be fooled by overly-optimistic prices on Craigslist, either. A buyer will not care how much you paid when it was new. Your goal is to make some money, any money. Ask first if they will take away your furniture for free. Some organizations may charge a fee for pickup of large items, since the truck and the gas and staffing cost them money. On the other hand, donating your furniture turns it into a charitable contribution. Keep good records of what you give away and talk to a financial advisor. Another option--hauling your sofa to the curb and hoping someone takes it--may be allowed in some communities, but not in others. 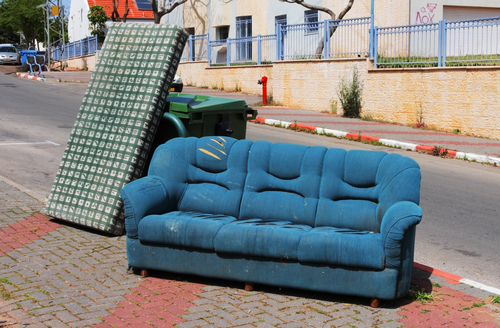 You run the risk of turning your furniture into an eyesore if no one comes to pick it up. And if it starts to rain or snow, no one will ever want that soggy sofa. That leaves taking your wet sofa to the dump. For large furniture items like sofas, chairs and tables, you may need to rent a truck to be able to take the item away. Get some strong people to help you out. If you're getting rid of the sofa because of back issues, you stand a chance of hurting yourself. 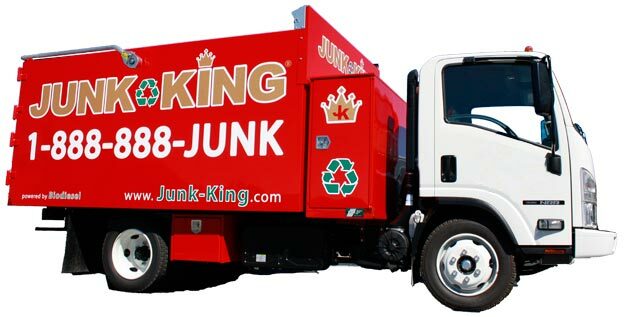 This is when it's time to hire a junk removal service, such as Junk King. You can rent a dumpster if you have to empty out a house, a basement or attic, but if it's just one or two large furniture items, it's more economical to have them taken away. Junk removal services make it a business to help you get rid of unwanted items. Their knowledge of other resources can save you time. Don't have time to cold-call local shelters and see if they will pick up your sofa? Let them appraise your sofa and see if it should have a second life somewhere else. When choosing a junk removal service, find out what items they take. Keep an eye out for businesses with green practices, because they can recycle composite items better than you. Older pieces, like that Singer sewing machine, can be separated into wood and metal. Newer furniture combines wood, metal and human-made substances such as polyurethane foam. Wood and metal can be recycled, while the rest of the sofa can be disposed of in an environmentally friendly way before it hits a landfill. Saying goodbye to your old sofa may make you a little nostalgic. That's OK. Just think of all the good times you and your loved one will have on your new sofa--a place where you can fall in love all over again.